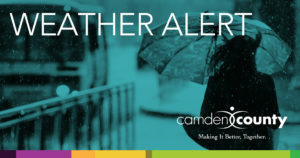 (Gloucester Township, NJ) – Freeholder Carmen Rodriguez, liaison to the Camden County Department of Health and Human Services, advises municipalities that Camden County will be under a Code Blue Alert tonight into tomorrow. The Health Officer issued the Code Blue advisory for the county effective from 7 p.m. tonight until 7 a.m. tomorrow. The Office of Emergency Management is also monitoring conditions.